It's an odd quote that seems to sink itself. Poets relate to romantic fantasy and not impersonal technology? You could interpret this quote a dozen ways. I'm guessing the knight would prefer a button to his sword right about now. Where they're going, nobody knows. But we'll never know where they've been. We have a program of the whole damned show. But with this new bunch we haven't a chance. For the 509th is winning the war. Auden obviously never read Kipling. Trying to do some detective work, and it appears the Auden quote comes from a March 1958 "Camera 3" show with interviewer James McAndrew with WH Auden. "About Writing", a book by Samuel R Delany has a reference to the interview pp 305-306 (Google books). Apparently, the interviewer was attempting to get Auden to validate the interviewer's thesis that "the historical purpose of the poet has been to provide images of heroes for the nation." 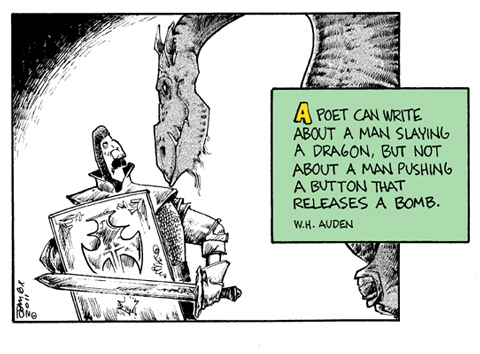 Auden explains that pressing a button to drop a bomb is far different than Achilles fighting a one on one combat with Hector. which is origin of the quote. Auden was completely misunderstood, although I'm not sure exactly what Auden meant. As John said, it could be interpreted a dozen ways. I don't think it was necessarily intended as anti-technology or a misunderstanding of it, I think it was intended to disagree with the interviewer about his view of the role of the poet and move onto something related to poetry. By the way, is the epic fight between Obi Wan Kenobi vs. Darth Vader in Star Wars (the original) any less than the Achilles vs. Hector battle because it uses technology? Too bad this isn't a "Say What". "You look mighty tasty in that glaze of tin. Prepare to be flame broiled". I'm fairly certain that Auden meant that [given his paradigm of being a stuffed-shirt romantic] it wouldn't be possible to write such a poem because of the complete impersonality (impersonalness?) of a person pushing a button to destroy legions of people--having never been engaged with them in any way. He was wrong, of course. Isolation is as valid a concept as relatedness. We're all limited. Herbert Simon said it well when he put forth the principle of bounded rationality. Simon might also have called it "reality". S.I. Hayakawa could have had a lot of fun with it. This page contains a single entry from the blog posted on August 1, 2011 12:08 AM.